I know a lot of busy moms. Most of them have twins or triplets plus maybe a spare kid or two on top of that. They go to soccer practice and school functions, doctor’s appointments and book club meetings, and many also hold down full or part-time jobs! They can use all the help they can get! These are exactly the women I thought of when Amanda from FoodontheTable.com contacted me about their new website for meal planning. I think this is such a great website. Really useful for the the busy family. It’s simple enough to start. Type in your name and zip code so that it can pull the prices from your local grocery stores. Then pick your food preferences ( for instance I left out fish since Blaine is allergic) Then click Start A New Meal Plan. From there you pick your proteins, how many meals you want to plan, and whether saving time, money, or eating healthy or eating familiar meals is your priority. Then boom! 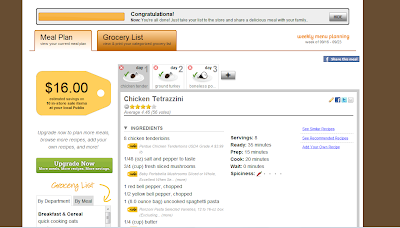 Your meal plan is made complete with recipes, coupons, and grocery lists. It will even tell you how much you are saving on your trip. You can also add your own recipes, or change any that don’t sound good to you. You can even tweak recipes by changing how many servings or what ingredients you want. It really is pretty cool. You can even send it to your phone or email! Really, I can’t believe somebody didn’t come up with this sooner. 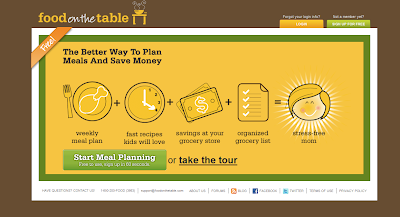 Now the pro’s to this website are obvious; they make meal planning easy, quick and painless. 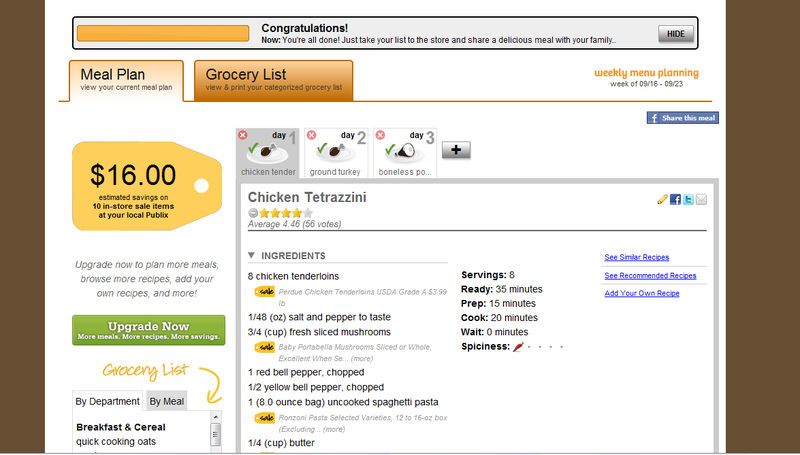 In general they do a great job matching recipes to what’s on sale to give you the best value possible. The con’s are that all of your local grocery stores may not be available on the site yet and I can’t say for certain that you would get the absolute lowest priced meal plan you could possibly came up with. 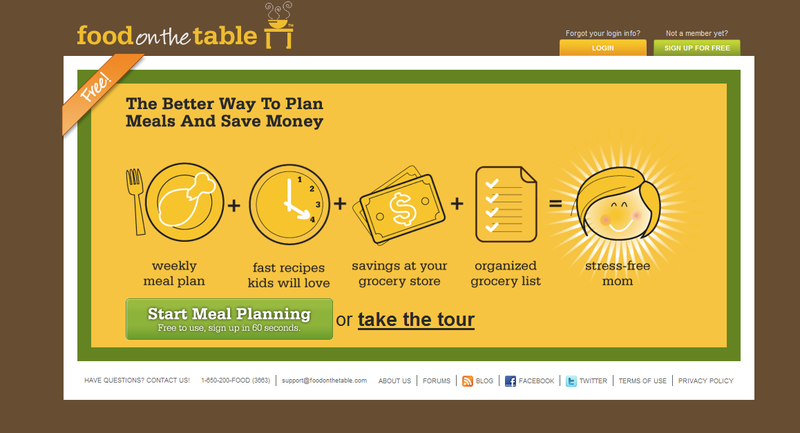 But if you are a busy mom who needs a hand with meal plans and budgeting, I think this is a great site! You can try the free version to see if you like it. You can plan up to 3 meals at a time! 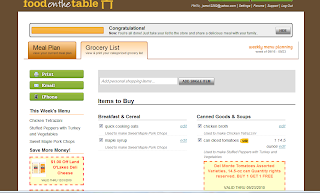 Now, I also want to add that I am not getting paid for this review, but they are giving away a $25 gift certificate to YOUR favorite grocery store and a free month of Premium service to FoodontheTable.com. I am also doing a guest post today over at their blog all about freezer meals and batch cooking! So go check that out too! You must be a follower and leave a comment on this post telling us if you meal plan or fly by the seat of your pants. You can also enter a second time by following me on Twitter and tweeting this post or becoming a facebook follower! Leave another comment with a link to your tweet! Contest ends on October 1st at midnight! US Only please! Of course the last test of a website like this is the recipes. You can be the coolest site in the world but if your recipes stink your not worth anything. Well, I made their Garlic Roast Chicken and I’ll tell you that it’s very good. A nice tender chicken with great flavor. It is a great weeknight dinner and super easy to put together. Rinse the chicken and pat dry. Zest the lemon. Slice remaining lemon into quarters and place to the side. With hand mixer combine butter, lemon zest, minced garlic and 1/4 cup chopped rosemary. Take your hand and slide the butter mixture between the skin and the meat on the breast, as well as loosening the ‘pockets’ between the leg and wing joints and inserting the butter there. Season the cavity of the chicken with the salt, pepper and paprika. Add the quartered lemon, rosemary sprigs and sliced garlic to the chicken cavity. Bind the legs with twine and tuck the wings into the leg joints to secure. Place the chicken breast up onto the roasting rack and into the oven. Roast for approximately 50 minutes, or until the juices run clear. Remove the ‘stuffing’, carve and serve. I am a meal planner most of the time!!!! I'm a meal planner! I used to be a lot better about it but after I had my son its gotten harder to keep up with! 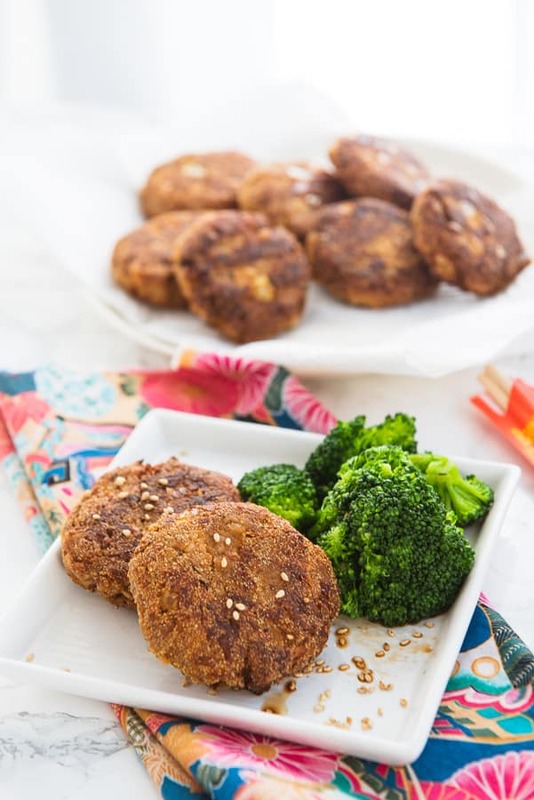 I try to meal plan and love using recipes but it doesn't always go as planned!! Hot dogs anyone? i go grocery shopping once a week, in which i usually plan about half the meals, and fly by the seat of my pants for the other half! I mostly fly by the seat of my pants, working from a stocked pantry, fridge, and freezer. I knd of plan what I'll make with things as I buy them. I am a meal planner for sure. I do my menus at the end of the month for the next month, and I buy as much at ALDI as I can. I am definitely a planner.. I think about what I'm going to make the next week the entire week beforehand! I like to meal plan and feel so much better about the week/s when I do, but end up flying by the seat of my pants most of the time b/c I haven't found a consistent system that works for me. I currently do not plan meals but I *really* need to now that I have a 3-year-old and 2-month-old. I kinda don't know where to start. 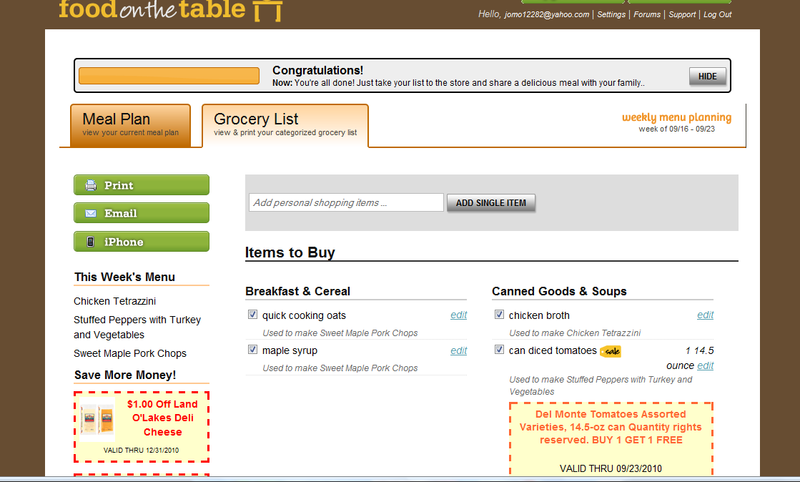 Guess I'll be spending some of my spare time checking out foodonthetable.com! I do not meal plan, I usually decide last minute what to cook and then go to the grocery store. follow via google.